Check out our selection of trailer U-bolts -- we have every U-bolt shape and size available to fit all your trailer needs! Square and Round U-Bolts, Stainless Steel Boat Trailer U-Bolts, Hot-Dipped Galvanized Boat Trailer U-Bolts, and Zinc Plated Trailer U-Bolts. From 3/8 inch diameter to 1/2 inch diameter! 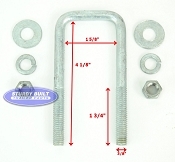 Our Stock of U-Bolts is meant to apply to nearly every need a Boat Trailer or Utility Trailer could have. The Dimensions on the U-Bolts are listed based of the Material the U-bolt is meant to go around. All U-Bolts come with the hardware that is pictured with it. When you're looking for trailer U-bolts, you don't go to the hardware store, you go to the company that specializes in top quality trailer parts, and that's Sturdy Built. Our selection of trailer U-bolts offers virtually every shape and size you'll need for a perfect fit, no matter what your trailer set-up may be. 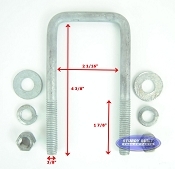 From square and Round U-Bolts, Stainless Steel Boat Trailer U-Bolts, even Hot-Dipped Galvanized Boat Trailer U-Bolts. From 3/8 inch diameter to 1/2 inch diameter! Our Stock of U-Bolts is meant to apply to nearly every need a Boat Trailer or Utility Trailer could have. The Dimensions on the U-Bolts are listed based of the Material the U-bolt is meant to go around. All U-Bolts come with the appropriate hardware sets for easy installation every time.